The windy weather gave us a chance to explore the effect of the wind on the world around us. We created our own kites so we could enjoy making our kites dance in the wind. In Reception, we like to make fishing rods so we can fish in the stream. We are learning how to tie knots so we can do this independently. When Frosty the Snowman came to visit, we made houses for him to live in. 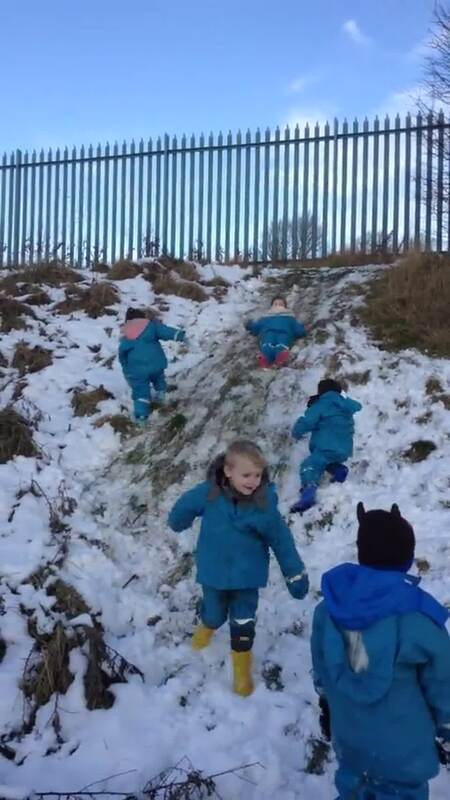 He loved playing in the snow with his friends in Reception. RAH really enjoyed their time in the snow. We had to make sure we were all wrapped up before we went outside. We made dinosaur egg nests and found The Snow Queen's ice crystals. Apparently they have secret powers that you can use if you find one. In Reception, we love to move large logs and branches. We learn how to move them safely with the help of our friends. We noticed that the bird feeders were empty so we made a bird feed mix. It was a very sticky job but good fun. The birds won't be going hungry for a long time. We found some dinosaur fossils in the stream. Some of us built a dinosaur den where the dinosaur can keep her eggs safe.